We are an Australian-Danish family company founded in 2010 while still living in Australia. Allan is a qualified chef and organic farmer and is deeply interested in where food comes from and how it is produced. We always had a passion for supporting sustainable organic and fairtrade food sources and a great love for chocolate. Our first company back in Australia we named ‘Andersen Cacao Creations’ to include our Danish heritage. In 2016 we returned to Denmark and brought with us the passion and experience of building up a business that grew solely on word of mouth into a family company incorporating a team of distributors, shops and creative chefs and catering companies. To mark a new beginning in Denmark, we renamed our business to‘Pods of Beans’ . We are happy to work in many creative ways with our Danish clientele to help them adding that extra conscious touch to their own businesses. We have carefully selected the best organic ingredients, namely cocoa from organic ‘raw’ Criollo cocoa beans, which are recognized for their fine taste. This cocoa originates from the Peruvian Amazon and is supporting a co-op of organic small farmers. 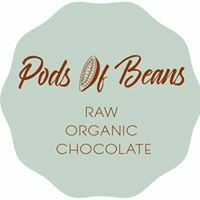 These beans allow us to produce natural “raw” chocolate products of absolute highest quality (75% cocoa): Chocolate, chocolate bark (thin chocolate slices), chocolate spread, chocolate drink, etc. We pride ourselves to create exquisite products that maintain their high nutritional value, all still carefully produced by hand in small portions and at low temperatures and, of course, in Denmark now. They are 100% vegan, gluten and lactose free.